If you want to see the future of digital packaging printing in action, you need go no further than Tulsa, OK. That’s clear from my visit yesterday to Odyssey Digital Printing as part of Xeikon’s pre-Labelexpo Americas 2010 briefing. Odyssey, one of the few digital-only packaging printers and converters in the US, is the home of four Xeikon presses, one DI press and seven large-format inkjet systems. While its primary product is POP displays, it’s doing increasing business in packaging and labels, thanks to the Xeikon units. 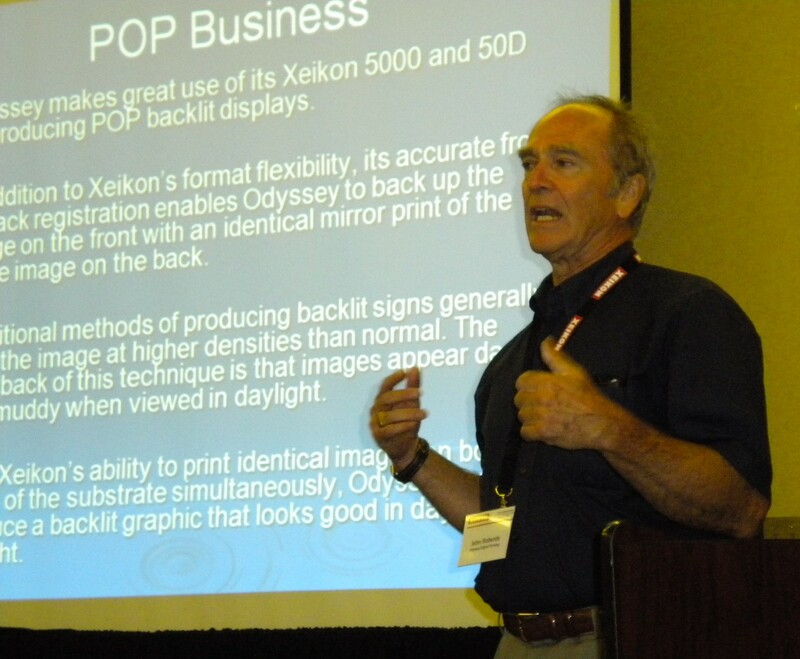 Odyssey Digital Printing president John Roberds addresses attendees at the Xeikon briefing. Odyssey has been on the cutting edge with Xeikon since late 2008 when it installed a Xeikon 3300. Now, the $7-million converter, which credits 60% of its sales to Xeikon-printed product, just installed the new Xeikon 3500 press two weeks ago. That system made its debut at last spring’s IPEX show. (See details on the 3500 below). 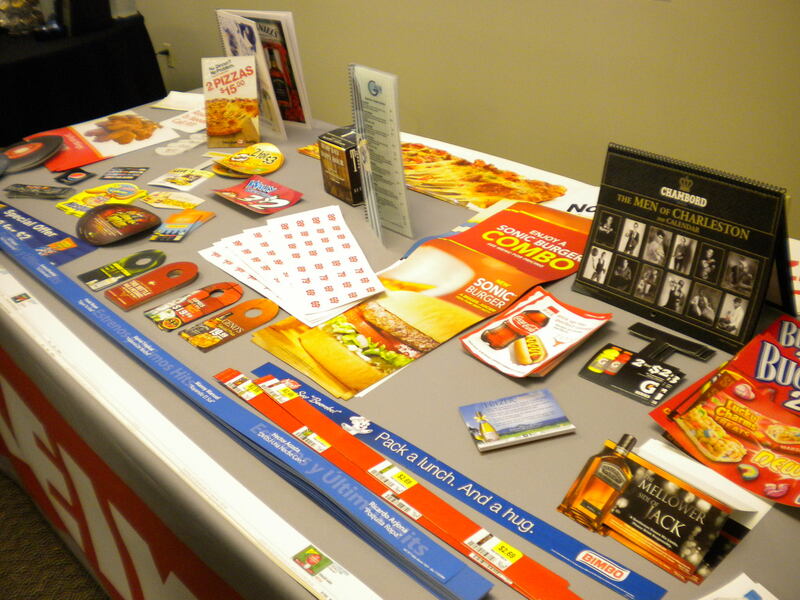 Examples of Odyssey Digital Printing products. Some of the customers taking advantage of Odyssey’s digital technology include Titleist (for extremely low runs of custom golfball sleeves), Yankee Candle Co. (for equally short runs of custom labeling), CVS Pharmacy (for shelf/product management strips) and QuikTrip convenience stores. “As much as possible, we’re digitally printing packaging to support other people’s products, not things that may be devalued by the Internet,” explains Roberds. The Tulsa converter’s operation is far-reaching. PDFs are received via FTP site; orders via email. Files are preflighted to the Xeikon print templates, and press operators queue the jobs to run on the appropriate Xeikon press. Printed webs are rewound for downstream coating on a Xeikon UCoat and diecutting on either an MGE/Zund i-Cut system for the labels or a Preco 2024 die press for paperboard. Boxes are then run through a Universal folder/gluer and packaged for shipment. The company also provides kitting and fulfillment services. 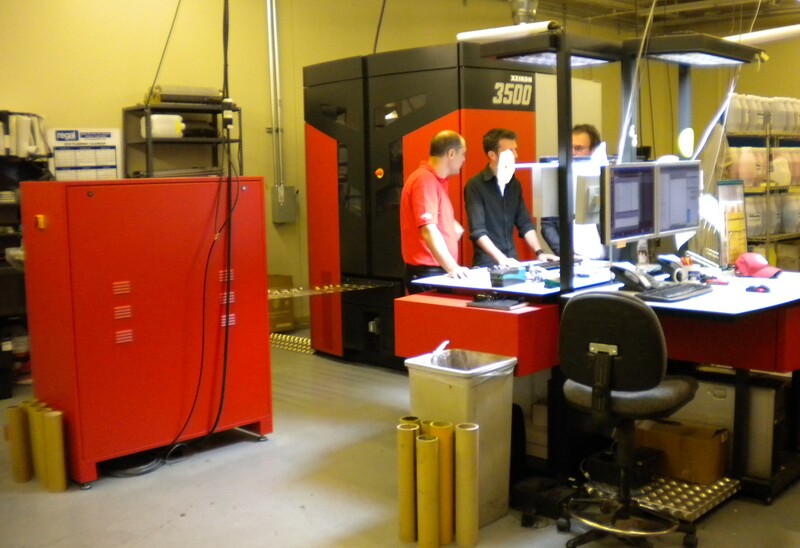 Operators confer at the controls of Odyssey's new Xeikon 3500 digital press. The average job at Odyssey is about 300-400 lineal ft by 20 in. wide. The presses run two shifts a day, five days a week. Five dedicated digital-press operators are employed; the least experienced has five years of such work to his credit already. Registration and color density are checked on-the-fly during digital printing, and Roberds says maintenance on the Xeikon systems totals only about 8 hours/week. With the Xeikon 3500 in production, Odyssey managers feel even better positioned for the challenges ahead. But they’re not stopping now. Roberds and his team will attend Labelexpo Americas later this month to seek out some sophisticated finishing equipment. They’re looking for a web-fed, off-line system that can UV-coat, laminate, spot-coat, rotary die-cut and sheet their printed rolls. That’s a tall order. Any takers? A few years ago, when Xeikon saw the commoditization of digital printing appear, it decided to focus on niche and emerging markets, says Michael Ring, president of Xeikon North America. Namely, labels, packaging and POP displays, he explains. Its focus today is on high-volume applications for its equipment in the space between inkjet units and current digital presses, between the Xerox iGEN4 and HP Indigoes and the Kodak Prospers. Yankee Candle p-s clear-on-clear labels are rewound after printing on the Xeikon 3500 digital press. Xeikon’s reworked 3000 Series, launching at Labelexpo Americas 2010, reflects this strategy. Four models in the digital label-press line include the completely new Xeikon 3050 and an upgraded replacement for the original Xeikon 3000 called the Xeikon 3030. That entry-level 3030 will debut at the Labelexpo Technology Workshop. The Xeikon 3500 will also be demo’d for the first time in North America at Labelexpo. “Label applications are ideal to take advantage of the flexibility of our technology,” says Filip Weymans, business development mgr. 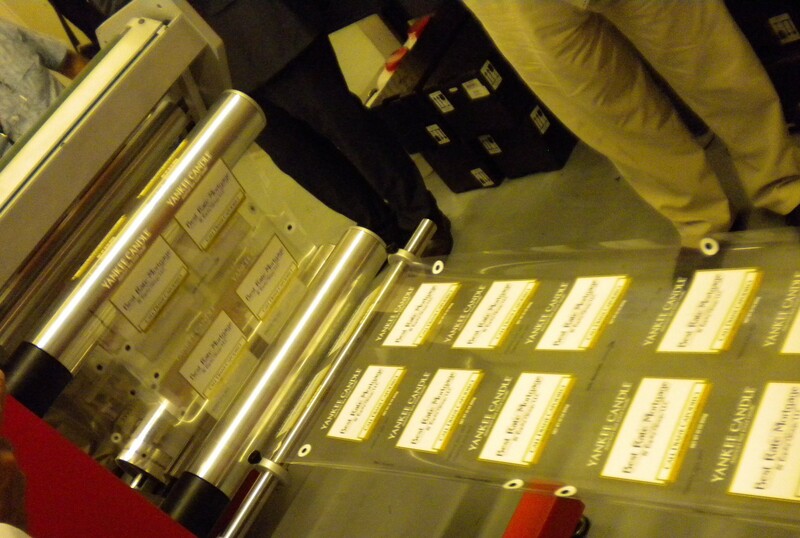 for Labels & Packaging at Xeikon. The 3000 Series lets converters go from a narrower-width, slower system (3030 with 13 in. at 31.5 fpm) to a highly productive, wider unit (3500 with 20.3 in. at 63 fpm). All models are 5-color with 1,200-dpi resolution. They all print on a wide range of substrates without pre-coating, such as p-s films, paperboards and foils. And all models can run Xeikon’s new QA-I toner, which is FDA-compliant for indirect food contact and direct contact for dry foods. Xeikon isn’t forgetting prepress and workflow. The 3000 Series works with Xeikon’s X-800 digital front-end, which is equipped with a new Adobe PDF Print Engine. At Labelexpo, the supplier will also be demonstrating Web2Print applications and showing examples of how MIS data can drive both flexo and Xeikon presses while capturing real-time production data and sending it back to the converter’s MIS. This entry was posted in digital printing, labels, paper/paperboard/cartons and tagged boxes, converting, labels, plastic film, printing. Bookmark the permalink. I used Odyssey a few years ago for a folding carton sampling/branding exercise. Their capabilities are perfect for Variable On Demand small footprint carton apps. Nice well-written article. Can you share what the minimum run might be before they consider a job inappropriate for firing up this system – or, asked another way, if a prospect is interested in seeing a sample / example of the final products, can this be used to print just one label – you know, like a digital proofing system, or do they use some other device (like the EPSON WT7900) to proof on clear plastic with white ink ? Michael, as far as I understand, Odyssey does take orders for exactly ONE label. Their customer Yankee Candle allows people to place such orders online, and get them printed, applied to one candle and shipped back. Contact Odyssey directly. They are a very open, helpful company.